If you couldn’t tell from Katy Perry’s Technicolor Super Bowl performance last night, you can look for proof in these delightful and colorful brushes from Sephora. The “Different Strokes Brush Set” retails for $54, which isn’t exactly cheap — but it’s also not expensive relatively speaking. A pointy powder brush, perfect in pink, for your nose. A face brush, in apricot, that hugs the curves of your face, much like the new Estee Lauder Sculpting Foundation Brush. This brush is most certainly from Anisa International’s patent-pending Glider Collection. A sunny yellow eye shade brush. The fiber is said to be synethetic, but we can’t speak to the quality of that synthetic fiber because Sephora doesn’t say whether it’s old-fashioned Taklon, which doesn’t hold product incredibly well, or one of the advanced new synthetic fibers on the market. I’d want to test out the fiber on these babies out before laying down about $10 a brush (give or take the faux pebble leather flat brush pouch). If they turned out to be a cheap synthetic fiber that doesn’t hold product, they may not really be worth it. Aside from the standard-looking polished aluminum ferrules, the handles also appear to be painted wood, and remind us a great deal of the affordable and colorful brushes under the Sonia Kashuk label over at Target, which has gotten a bit more (booor-ing) neutral in its palette recently. 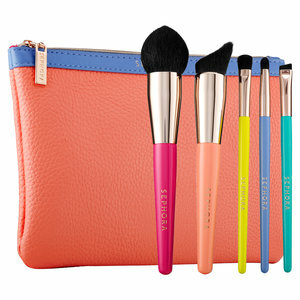 But if you’re looking for a little pick-me-up after the winter blahs, Sephora’s set may the be the ticket to paradise.